Between 1788 and 1834 black Baptists formed their first distinctively black congregations and organized regional associations. By 1831, when an enslaved Baptist preacher named Nat Turner inspired an insurrection against slaveholders in Virginia, black Baptist had acquired “a peculiar and precarious religious freedom.” Turner’s rebellion and the black Baptist role in ending slavery in Jamaica brought restrictions on the movements of black preachers, but black Baptists continued to preach and to claim the freedom to worship as communities of believers. As James Melvin Washington demonstrates in this path making study, the black Baptist struggle for religious freedom was also a quest for identity and community. From the beginning black Baptist battled “the perverse trusteeship of the slave regime.” At every stage their relations with white Baptist. Biracial Congregations, formed in the enthusiasm of mission efforts among the slaves, dissolved as Christian doubt and rationalization about slavery increased. 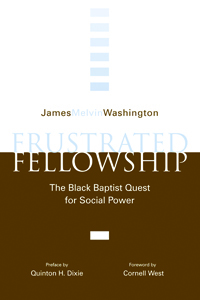 Frustrated Fellowship is a careful, critical study of the black Baptist struggle for freedom, community, and integrity by a seasoned, gifted scholar whose passion and judgment inform every page of a truly significant undertaking.